Every term, academic lessons come to an end and Chetham’s devotes itself to performance. The Autumn Music course is particularly special, as for many young players it is a first chance to perform for family members alongside friends from their new school, whilst for others it’s a chance to step up into more senior ensembles, take the lead within their section, or even lead the orchestra in a concerto solo. With our first Open Day of the year coinciding with the course, it’s also a chance to meet prospective students and give them a taste of life at the UK’s largest specialist music school. This October we were delighted to be joined for Music Course by three very special guests. 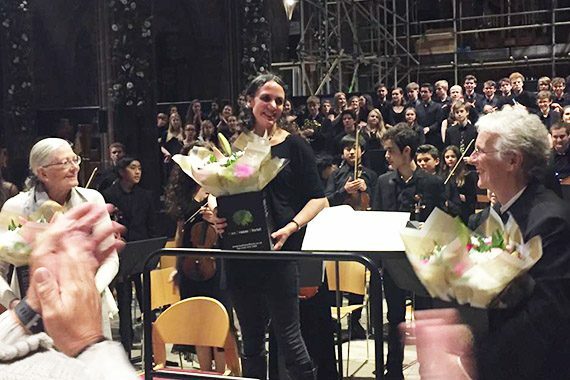 Composer Laura Rossi, now a firm friend of the School, returned with her latest piece, Voices of Remembrance, inspired by poetry written during WWI. The work was performed by Chetham’s Sinfonia and Chamber Choir at Manchester Cathedral on Tuesday, with the original poems read by the incomparable Vanessa Redgrave. We were delighted that North West Tonight joined us for the afternoon’s rehearsal, and that the performers played to a deservedly packed Cathedral. Building the atmosphere in the first half were three smaller ensembles. Saxophone Choir, Violetta Strings – featuring some of the School’s most junior performers – and Wind Band presented a varied and lively programme to contrast with the more serious content to follow. 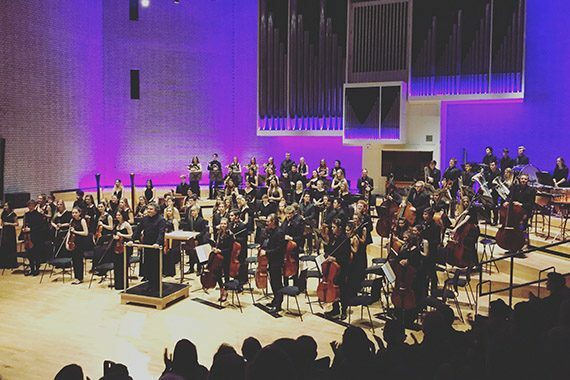 On Thursday, Chetham’s flagship Symphony Orchestra presented a stunning programme featuring two concerti performed by pianist Callum McLachlan and Linda Heiberga on cello. Conductor Paul Mann – himself a Chetham’s alumnus – then recaptured his school days by leading the orchestra through Mussorgsky’s Pictures at an Exhibition, orchestrated by Ravel. The piece was familiar to Mann as, when a piano student at Chetham’s, he performed it himself in its original version as a piano suite, and it concluded at RNCM Concert Hall to enthusiastic applause. Congratulations to all of the students involved, and thanks as ever to the staff and families who supported them. Music Course is now over until February for most of the School – but for a small group, there’s one more performance to go as they play alongside Mr Threlfall and musicians from Jersey Academy of Music in a reprise of Voices of Remembrance at Jersey Opera House tomorrow.